A ROOT file is structured in Directories (like a file system). 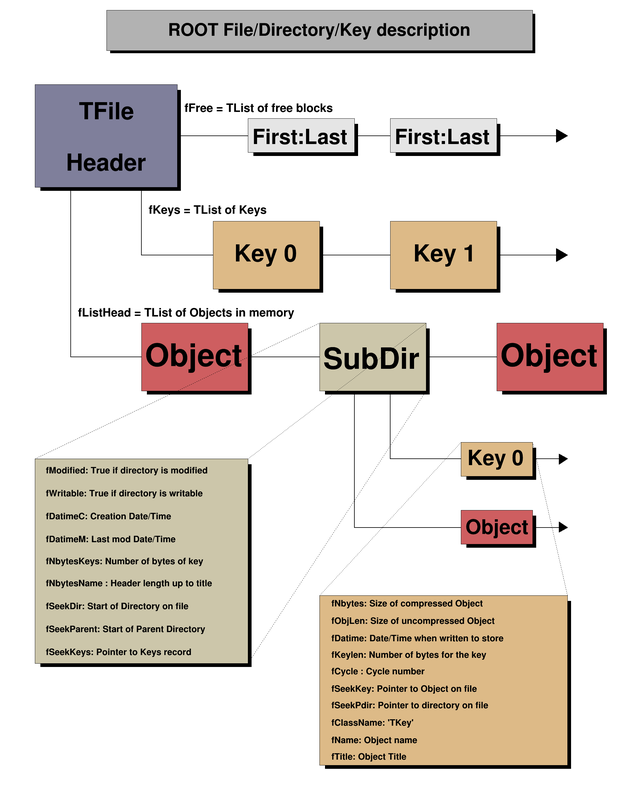 Each Directory has a list of Keys (see TKeys) and a list of objects in memory. A Key is a small object that describes the type and location of a persistent object in a file. The persistent object may be a directory. Definition at line 32 of file TDirectoryFile.h. Definition at line 57 of file TDirectoryFile.h. Definition at line 179 of file TDirectoryFile.cxx. Definition at line 59 of file TDirectoryFile.cxx. A new directory with a name and a title is created in the current directory. The directory header information is immediatly saved on the file A new key is added in the parent directory. When this constructor is called from a class directly derived from TDirectoryFile, the third argument, classname, MUST be specified. In this case, classname must be the name of the derived class. Note that the directory name cannot contain slashes. Definition at line 78 of file TDirectoryFile.cxx. Definition at line 190 of file TDirectoryFile.cxx. Definition at line 63 of file TDirectoryFile.h. Append object to this directory. If replace is true: remove any existing objects with the same same (if the name is not ""
Definition at line 222 of file TDirectoryFile.cxx. Insert key in the linked list of keys of this directory. Definition at line 238 of file TDirectoryFile.cxx. Browse the content of the directory. Definition at line 273 of file TDirectoryFile.cxx. Definition at line 318 of file TDirectoryFile.cxx. Change current directory to "this" directory. where file.root is the file and /dir1/dir2 the desired subdirectory in the file. Relative syntax is relative to "this" directory. E.g: ../aa. Returns kTRUE in case of success. Definition at line 353 of file TDirectoryFile.cxx. Definition at line 363 of file TDirectoryFile.cxx. If the object derives from TNamed, this function is called by TNamed::Clone. TNamed::Clone uses the optional argument newname to set a new name to the newly created object. If autoadd is true and if the object class has a DirectoryAutoAdd function, it will be called at the end of the function with the parameter gDirectory. This usually means that the object will be appended to the current ROOT directory. Definition at line 386 of file TDirectoryFile.cxx. Delete all objects from memory and directory structure itself. Reimplemented in TSQLFile, TFile, TNetFile, TXMLFile, and TParallelMergingFile. Definition at line 559 of file TDirectoryFile.cxx. Definition at line 69 of file TDirectoryFile.h. Delete Objects or/and keys in a directory. namecycle = "" is same as namecycle ="T*"
Definition at line 630 of file TDirectoryFile.cxx. Encode directory header into output buffer. Reimplemented in TSQLFile, TFile, and TXMLFile. Definition at line 734 of file TDirectoryFile.cxx. Find key with name keyname in the current directory. Definition at line 769 of file TDirectoryFile.cxx. Find key with name keyname in the current directory or its subdirectories. Definition at line 785 of file TDirectoryFile.cxx. Find object by name in the list of memory objects of the current directory or its sub-directories. After this call the current directory is not changed. To automatically set the current directory where the object is found, use FindKeyAny(aname)->ReadObj(). Definition at line 825 of file TDirectoryFile.cxx. Scan the memory lists of all files for an object with name. Definition at line 444 of file TDirectoryFile.cxx. Return pointer to object identified by namecycle. The retrieved object should in principle derive from TObject. If not, the function TDirectoryFile::Get<T> should be called. However, this function will still work for a non-TObject, provided that the calling application cast the return type to the correct type (which is the actual type of the object). In case the class of this object derives from TObject but not as a first inheritance, one must use dynamic_cast<>(). Of course, dynamic_cast<> can also be used in the example 1. Definition at line 912 of file TDirectoryFile.cxx. Definition at line 79 of file TDirectoryFile.h. Return the buffer size to create new TKeys. If the stored fBufferSize is null, the value returned is the average buffer size of objects in the file so far. Definition at line 1092 of file TDirectoryFile.cxx. Definition at line 88 of file TDirectoryFile.h. const char * funcname = "GetDirectory"
Find a directory named "apath". where file.root is the file and /dir1/dir2 the desired subdirectory in the file. Relative syntax is relative to "this" directory. E.g: ../aa. Returns 0 in case path does not exist. If printError is true, use Error with 'funcname' to issue an error message. Definition at line 473 of file TDirectoryFile.cxx. Definition at line 89 of file TDirectoryFile.h. Return pointer to key with name,cycle. Definition at line 1104 of file TDirectoryFile.cxx. Definition at line 91 of file TDirectoryFile.h. Definition at line 92 of file TDirectoryFile.h. Definition at line 93 of file TDirectoryFile.h. Definition at line 94 of file TDirectoryFile.h. Definition at line 989 of file TDirectoryFile.cxx. Return pointer to object identified by namecycle if and only if the actual object is a type suitable to be stored as a pointer to a "expectedClass" If expectedClass is null, no check is performed. Definition at line 1016 of file TDirectoryFile.cxx. The returned object may or may not derive from TObject. The calling application must cast the returned object to the final type, e.g. Definition at line 981 of file TDirectoryFile.cxx. Definition at line 95 of file TDirectoryFile.h. Definition at line 97 of file TDirectoryFile.h. Definition at line 96 of file TDirectoryFile.h. Initialize the key associated with this directory (and the related data members. Definition at line 149 of file TDirectoryFile.cxx. Definition at line 98 of file TDirectoryFile.h. Definition at line 99 of file TDirectoryFile.h. -m: only list objects in memory The <regexp> will be used to match the name of the objects. By default memory and disk objects are listed. Definition at line 1135 of file TDirectoryFile.cxx. const char * title = ""
Create a sub-directory "a" or a hierarchy of sub-directories "a/b/c/...". Returns 0 in case of error or if a sub-directory (hierarchy) with the requested name already exists. Returns a pointer to the created sub-directory or to the top sub-directory of the hierarchy (in the above example, the returned TDirectory * always points to "a"). Definition at line 1200 of file TDirectoryFile.cxx. Definition at line 1184 of file TDirectoryFile.cxx. Purge lowest key cycles in a directory. By default, only the highest cycle of a key is kept. Keys for which the "KEEP" flag has been set are not removed. See TKey::Keep(). Definition at line 1239 of file TDirectoryFile.cxx. Read objects from a ROOT file directory into memory. Definition at line 1275 of file TDirectoryFile.cxx. Read the linked list of keys. Every directory has a linked list (fKeys). This linked list has been written on the file via WriteKeys as a single data record. This is an efficient way (without opening/closing files) to view the latest updates of a file being modified by another process as it is typically the case in a data acquisition system. Definition at line 1328 of file TDirectoryFile.cxx. Read object with keyname from the current directory. Read contents of object with specified name from the current directory. First the key with keyname is searched in the current directory, next the key buffer is deserialized into the object. The object must have been created before via the default constructor. See TObject::Write(). Definition at line 1414 of file TDirectoryFile.cxx. Reset the TDirectory after its content has been merged into another Directory. This returns the TDirectoryFile object back to its state before any data has been written to the file. The object in the in-memory list are assumed to also have been reset. Definition at line 1436 of file TDirectoryFile.cxx. Removes subdirectory from the directory. Definition at line 1482 of file TDirectoryFile.cxx. Save recursively all directory keys and headers. Definition at line 1494 of file TDirectoryFile.cxx. Definition at line 1527 of file TDirectoryFile.cxx. Save Directory keys and header. If the directory has been modified (fModified set), write the keys and the directory header. This function assumes the cd is correctly set. New objects or modified objects have been written to the directory. You do not want to close the file. You want your changes be visible from another process2 already connected to this directory in read mode. In process2, use TDirectoryFile::ReadKeys to refresh the directory. Definition at line 1568 of file TDirectoryFile.cxx. Set the default buffer size when creating new TKeys. Definition at line 1589 of file TDirectoryFile.cxx. Definition at line 115 of file TDirectoryFile.h. Definition at line 116 of file TDirectoryFile.h. Find the action to be executed in the dictionary of the parent class and store the corresponding exec number into fBits. This function searches a data member in the class of parent with an offset corresponding to this. If a comment "TEXEC:" is found in the comment field of the data member, the function stores the exec identifier of the exec statement following this keyword. Definition at line 1604 of file TDirectoryFile.cxx. Set the new value of fWritable recursively. Definition at line 1623 of file TDirectoryFile.cxx. Return the size in bytes of the directory header. Reimplemented in TFile, TSQLFile, and TXMLFile. Definition at line 1646 of file TDirectoryFile.cxx. Write all objects in memory to disk. Loop on all objects in memory (including subdirectories). A new key is created in the keys linked list for each object. For allowed options see TObject::Write(). The directory header info is rewritten on the directory header record. Reimplemented in TFile, TSQLFile, ROOT::Experimental::TBufferMergerFile, TXMLFile, and TParallelMergingFile. Definition at line 1777 of file TDirectoryFile.cxx. Reimplemented in TFile, TSQLFile, TXMLFile, and TParallelMergingFile. Definition at line 1797 of file TDirectoryFile.cxx. Overwrite the Directory header record. Definition at line 2079 of file TDirectoryFile.cxx. Write Keys linked list on the file. Definition at line 2108 of file TDirectoryFile.cxx. Write object from pointer of class classname in this directory. Definition at line 1960 of file TDirectoryFile.cxx. Write object of class with dictionary cl in this directory. Definition at line 1987 of file TDirectoryFile.cxx. Write object obj to this directory. The data structure corresponding to this object is serialized. The corresponding buffer is written to this directory with an associated key with name "name". Creation of a support TKey object in the directory. The TKey object creates a TBuffer object. By default, the buffersize will be taken from the average buffer size of all objects written to the current file so far. Use TDirectoryFile::SetBufferSize to force a given buffer size. If a name is specified, it will be the name of the key. If name is not given, the name of the key will be the name as returned by obj->GetName(). "WriteDelete" Using the "Overwrite" option a previous key with the same name is overwritten. The previous key is deleted before writing the new object. Using the "WriteDelete" option a previous key with the same name is deleted only after the new object has been written. This option is safer than kOverwrite but it is slower. The "SingleKey" option is only used by TCollection::Write() to write a container with a single key instead of each object in the container with its own key. An object is read from this directory via TDirectoryFile::Get. The function returns the total number of bytes written to the directory. It returns 0 if the object cannot be written. WARNING: avoid special characters like '^','$','.' in the name as they are used by the regular expression parser (see TRegexp). Definition at line 1847 of file TDirectoryFile.cxx. Default buffer size to create new TKeys. Definition at line 41 of file TDirectoryFile.h. Date and time when directory is created. Definition at line 37 of file TDirectoryFile.h. Date and time of last modification. Definition at line 38 of file TDirectoryFile.h. Pointer to current file in memory. Definition at line 45 of file TDirectoryFile.h. Pointer to keys list in memory. Definition at line 46 of file TDirectoryFile.h. True if directory has been modified. Definition at line 35 of file TDirectoryFile.h. Number of bytes for the keys. Definition at line 39 of file TDirectoryFile.h. Number of bytes in TNamed at creation time. Definition at line 40 of file TDirectoryFile.h. Location of directory on file. Definition at line 42 of file TDirectoryFile.h. Location of Keys record on file. Definition at line 44 of file TDirectoryFile.h. Location of parent directory on file. Definition at line 43 of file TDirectoryFile.h. True if directory is writable. Definition at line 36 of file TDirectoryFile.h. ROOT 6.17/01 - Reference Guide Generated on Fri Apr 19 2019 04:54:22 (GVA Time) using Doxygen 1.8.14.